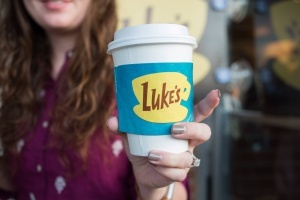 To celebrate the 16th anniversary of the first episode of Gilmore Girls, Birmingham coffee shops partnered with Netflix on October 6 and converted into the hit show’s own coffee shop, Luke’s Diner. 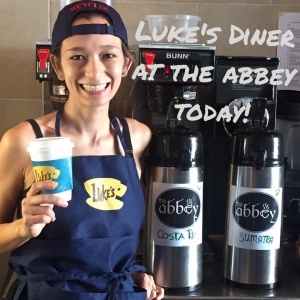 Lucy’s Coffee and Tea, Crestwood Coffee Co. and The Abbey were three of the 200 cafes around the country that participated in the pop up. The pop-ups were open from 7 a.m. to noon, and the first 200 guest received free coffee. The shops included décor from the show, such as Luke’s signs, aprons, backward caps, and coffee cups covered in Gilmore Girls quotes. Even the staff at the shops wore Luke’s Diner branded aprons and T-shirts. Netflix also announced a new season which is to premiere around Thanksgiving time. Lucy’s, a coffee shop located on University Blvd, was thrilled to be one of the Netflix-sponsored coffee shops. 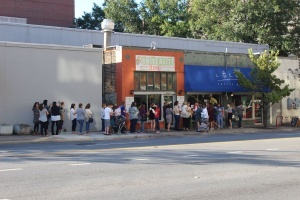 Early on, the line wrapped around the block as Gilmore Girls fans excitingly waited for their free cup of coffee. The coffee shops said that social media was a big factor in whether or not a café was chosen to host a Luke’s diner pop-up.